It’s not often that ice hockey and the Middle East mix. For Coach Mike Truskoski, however, it was the perfect combination to win the U16 Emirates Cup. During a one-year work assignment in Abu Dhabi — he helped build an airport there — he coached the Abu Dhabi Falcons, a team that comprised kids from all over the world. Some were from Sweden and Canada, both great hockey nations, some from the United States and South America and some from the Gulf States where it was typically 110 degrees and extremely dry during the day. “I had a great group of kids that worked hard every game and every practice on and off the ice,” said Coach Mike. “We were a group of mixed skill levels, and this group gave me a unique perspective on the abilities of players from around the world and how they can come together as one team, united, to win their first tournament together, each contributing just as much as the next, for their team and for each other. It is one of my proudest moments to be on the bench for that and a part of those kids’ lives for that moment. 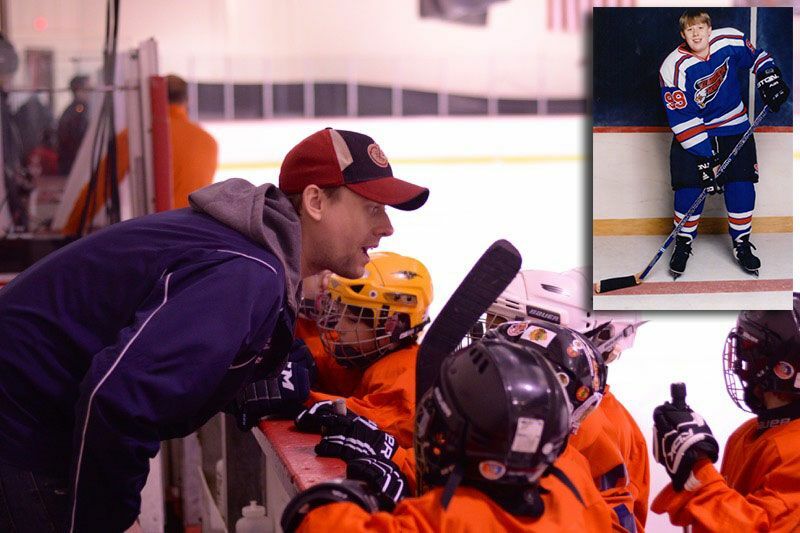 Today, you can find Coach Mike helping another group of kids bond as a team as the head coach of the Spring Mite 2 team. His own skills developed on a frozen pond down the hill from his house in Wisconsin. Coach Mike’s parents noticed from an early age that he liked to use sticks to hit anything he could, especially rocks, so they replaced the sticks with a proper hockey stick and the rocks with a puck. He joined the Elmbrook Eagles hockey program in Brookfield, Wisc., and played travel hockey starting at the squirt level. He played for Elmbrook through bantams and transitioned to his high school program after his final bantam season. While his preference was to play defense, and he had success at that position from squirts through peewees, he switched to wing as a bantam and center in high school. “The coaches liked my ability to take up space out front of the opposition’s net and bury rebounds along with my being able to move others out from the front of our net,” said Coach Mike. He made the move from playing in front of the net to coaching players from the bench in 2002 when he was a coach with a travel program in Houghton, Mich. He’s been coaching every season ever since. One word dominates his coaching philosophy and approach to hockey: respect. What kids find out quickly about Coach Mike is that he’s tall — really tall — and that he hardly yells. He also encourages parents to come watch their kids practice or play as much as possible. He says that he always sees kids working harder and having more fun when their parents are in the stands supporting them. And the practices and games are sure-fire ways to create lasting memories.